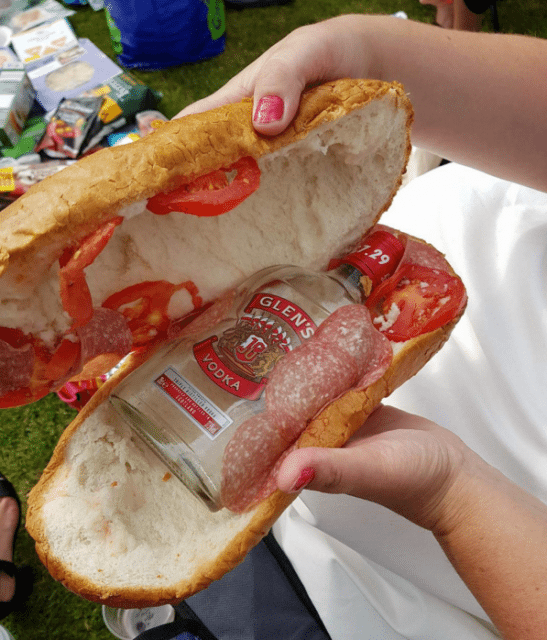 A racegoer’s plans for a ‘liquid lunch’ were reined in by staff at Southwell Racecourse on Sunday after the offending £7.29 bottle of Glen’s Vodka was discovered inside a tomato and salami sandwich. During routine searches at the racecourse gates, stewards were alerted to the suspect sarnie when inspecting a lady’s lunchbox. Speaking to Racing Post, Southwell executive director Mark Clayton said: “As part of the security policy throughout the Arc group, we have searches for alcohol, as well as ‘other objects’ as part of the anti-terror measures in place for all sporting venues”. In spite of the misdemeanour, racecourse staff posted a photo of the boozy butty on Twitter, promising a prize for the wittiest caption. In true British fashion, a number of commenters appeared to be more concerned that the roll was not buttered, with one adding: “Imagine not buttering! Every right to take it off them”. The Trojan sandwich incident also made others question whether Southwell Racecourse was charging the correct amount for alcohol on site. Clayton told Racing Post that the racecourse intends to honour the prize-giving promise, although did not comment as to what the reward would be.